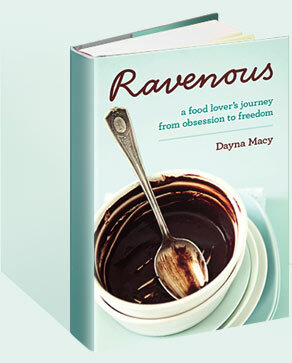 2012 January — Dayna Macy, author of "Ravenous"
Tomorrow is the one year publication date of Ravenous. It’s been quite a year. I spoke at bookstores and conferences about my own struggle to make sense of my relationship with food and my body. I received emails from people near and far who shared their own food stories and thanked me for sharing mine. And what I learned is this: there is almost no part of our lives that food doesn’t touch. We eat to survive, of course, and it’s troubling and sad that many people don’t have enough to do that. But for the lucky that do, our food contains stories– of who we are, who we wish we were, and who we hope to become. What we eat tells us where we came from, where we are, and where we hope to go. These stories connect us to ourselves, to our family, to our friends, to our community and the world. I had hoped that by writing Ravenous, I would figure out a way to eat that keeps my weight sane and offers me more ease in my body. Lord be praised I have! But I did not expect that by writing Ravenous, I would become less hungry in other areas of my life. I don’t need as much stuff as I use to, or as much praise as I once sought. Things I thought I wanted (oh you know, you can never be too rich, too famous, or too thin), turns out I don’t. Not really anyway. Not where it counts. Through writing my story, through creating something which for me is valuable, real and true, I have finally been able to shake the quiet desperation that ran through much of my life. Maybe I don’t need to endlessly strive for the next big thing, because life is good, here and now. I will continue to do my work, at home and in the world. And life will continue to unfold, I bet, in unexpected ways. And for that, and so much more, I am grateful.